Bernroitner, M., Zamocky, M., Pairer, M., Furtmuller, P.G., Peschek, G.A., Obinger, C.
Heme-copper oxidasesand their electron donors in cyanobacterial respiratory electron transport. 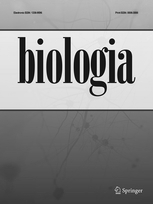 Bujdakova, H., Paulovicova, E., Borecka-Melkusova, S., Gasperik, J., Kucharikova, S., Kolecka, A., Lell, C., Jensen, D.B., Wurzner, R., Chorvat Jr, D., Pichova, E.
Antibody response to the 45 kDa Candida albicans antigen in an animal model and potential role of the antigenin adherence. The Lysis System of the Streptomyces aureofaciens Phage μ1/6. Harraghy, N., Homerova, D., Herrmann, M., Kormanec, J.
Mapping the transcription start point of the Staphylococcus aureus eap, emp and vwb promoters reveals a conserved sequence that is essential for expression of these genes. Homerova, D., Halgasova, L., Kormanec, J.
Cascade of extracytoplasmic function sigma factors in Mycobacterium tuberculosis: identification of a SigJ-dependent promoter upstream of sigI. Kukurova, K., Karovicova, J., Kohajdova, Z., Bilikova, K.
Authentication of honey by multivariate analysis of its physico-chemical parameters. Lewis, C., Skovierova, H., Rowley, G., Rezuchova, B., Homerova, D., Stevenson, A., Sherry, A., Kormanec, J., Roberts, M.
Small outer membrane lipoprotein, SmpA, is regulated by RpoE and has a role in cell envelope integrity and virulence of Salmonella enterica Serovar Typhimurium. Domain evolution in the GH13 pullulanase subfamily with focus on the carbohydrate-binding module family. Majtan, T., Singh, L.R., Wang, L.Q., Kruger, W.D., Kraus, J.P. Active Cystathionine beta-Synthase Can Be Expressed in Heme-free Systems in the Presence of Metal-substituted Porphyrins or a Chemical Chaperone. Pangallo, D., Drahovska, H., Harichova, J., Karelova, E., Chovanova, K., Aradska, J., Ferianc, P., Turna, J., Timko, J. Evaluation of different PCR-based approaches for the identification and typing of environmental enterococci. Pangallo, D., Drahovska, H., Harichova, J., Karelova, E., Chovanova, K., Ferianc, P., Turna, J., Timko, J. Assessment of environmental enterococci: bacterial antagonism, pathogenic capacity and antibiotic resistance. Vidova, B., Godany, A., Sturdik, E.
Rapid detection methods of microbial pathogens in foods-a short survey. Zamocky, M., Schumann, C., Sygmund, C., Callaghan, J.O., Dobson, A.D., Ludwig, R., Haltrich, D., Peterbauer, C.K. Cloning, sequence analysis and heterologous expressiuon in Pichia pastoris of a gene encoding a thermostable cellobiose dehydrogenase from Myriococcum thermophilum. Zamocky, M., Jakopitsch, C., Furtmuller, P.G., Dunand, C., Obinger, C.
The peroxidase-cyclooxygenase superfamily:Reconstructed evolution of critical enzymes of the innate immune system. Evolution of Catalases from Bacteria to Humans.